I am back with CCC this week and a new DT member as well! Welcome Barb to the team and leave her a comment! Here is the sketch to follow this week. We are sponsored by Stitchy Bear Stamps. Here is my take on the sketch this week. I am using "Busted" from Stitchy Bear Stamps collection. Got to love a little irony right!? Was have a sarcastic day when I made this one to say the least. 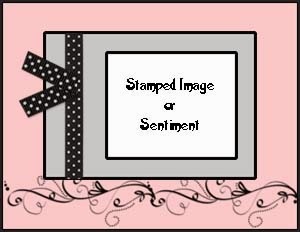 Papers are CTMH as are the embossed stamps and saying to the right of the focal point. Colored with copics and CTMH markers. Ribbon is from Target.